When someone is a false teacher, their perfidy can show almost immediately, as it did with Charles Templeton. Or it can be hidden for a number of years and emerge slowly and minimally, as has happened to Beth Moore. The above issues with Moore’s teaching remain the same, if not worse, and other concerns have been added to them by this date. Chris Rosebrough of Pirate Christian Radio chimed in soon after The King’s Dale did and went line by line through one of her teachings, biblically showing where Moore errs. He has doen so several times since. I’ve been tracking her since 2011. In the last 7 years Moore’s slide has become apparent. Her eisegesis, false notions, and cultural embeddedness have grown worse. Some people find it hard to accept the words “evil” when applied to Beth Moore. After all, she is bright, engaging, happy seeming, effective, and passionate. However, that is the evil genius of satan. If he had come to Eve as a red jumpsuited, pitchfork wielding demon, would she had listened? He came as himself, the most beautiful of angels, glory light shining softly with helpful words. So it is no surprise if his servants, also, disguise themselves as servants of righteousness. Their end will correspond to their deeds. (2 Corinthians 11:15). 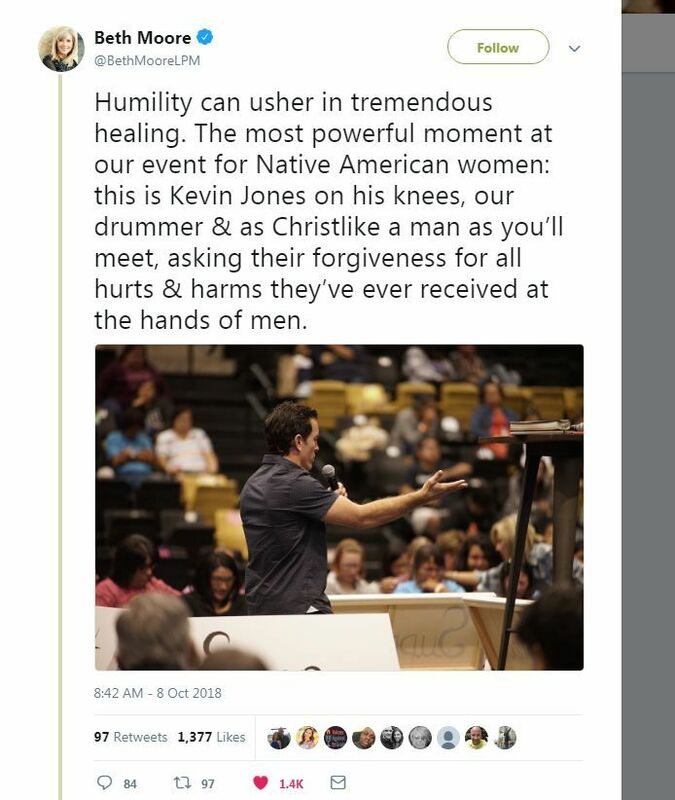 Of course this foolish act sparks a concern for Moore, Jones, and the thousands of women participating in the lesson in which Jones knelt. She is leading many astray. It’s a concern because it demonstrates how far gone Moore is into Social Justice, one aspect of which is seeking redress from people who have not hurt you personally but are lumped into some group defined by age, gender, and such. Her tweet and Jones’s action also perpetuates the false victim mentality. Have you been hurt? I’ve been hurt. Hurt is not defined in Moore’s tweet(s). The word ‘sinned against’ isn’t even used, just ‘hurt.’ This kind of language could include imagined hurts, past hurts, minimal hurts, or micro-aggressions (a new term that could describe something as slight as an imagined snub). A far cry from being disemboweled and burned at the stake, as many true martyrs were. The world is full of victims – victims of war, victims of genocide, victims of crime, victims of terror. The world is merciless for all of us on many levels. … Let me make it clear. In God’s eyes – listen – no one is a victim. We are all perpetrators of open rebellion, scandalous, blasphemous sin against God. We are all rebels, we are all obstinate, we are all stubborn. Let me make it clear. In God’s eyes – listen – no one is a victim. We are all perpetrators of open rebellion, scandalous, blasphemous sin against God. We are all rebels, we are all obstinate, we are all stubborn. Adam was representative of the entire human race. At birth, we are all in Adam. Jesus substituted Himself as the sacrifice and took the punishment we deserve as in-Adam people. Jesus’s work as the second Adam is finished. Therefore, there can be no third Adam. No one man can rorgive the “hurts” of all other men or women living and dead. It is ridiculous to even propose it. What Moore is promoting is corporate forgiveness by a sole representative. In the Old Testament, then, contrition took public form. The high priest confessed not only his sins, but the sins of all Israel. In the New Testament, a change takes place. God still has a people for himself, but he forms this covenant community not through a discrete nation, but an ingathering of Jew and Gentile alike (Romans 9-11). The gospel of grace in Christ crucified and resurrected entails not that God will create a second people for himself—composed of non-Israelites—but rather that the Abrahamic promises find their fulfillment in the Messiah. As the gospel is loosed, people from every tribe and tongue become citizens of the spiritual kingdom of Christ (Luke 11:20; Matthew 12:28; Hebrews 12:18-29). This is the true people of God; this is what the old covenant nation pointed to as the realization of the Abrahamic covenant. What we call the “theocratic” dimension of the Old Testament has therefore ceased. By this I mean that you cannot look at any one nation on the earth today and identify it as the household of God. The household of God is not a building or a political entity at all; it is the blood-bought church of Christ, the church made up of redeemed sinners (1 Timothy 3:15; Hebrews 10:21). There is no longer a ritual overseen by a high priest in which one imperfect human person confesses the sins of any “national” people of God. Every Christian confesses sin to one another, and Christ the high priest intercedes for us at the right hand of God (Mark 16:19; James 5:16; Hebrews 7:25). This is the pattern of our confession. We have a perfect high priest who prays for us continually, and out of the overflow of this intercession we confess sin to one another. It is remarkably easy to apologize for something you’ve never done to someone you’ve never wronged. Requires no humility, there’s nothing beneficial resulting from it, & it has no basis in Scripture. The whole point, as far as I can see, is to look holy, which is anti-Scripture. In the sixteenth century, Beth Moore would have been condemned as a heretic. Ladies, please avoid Beth Moore. As her paganhood descends further and further into depraved rebellion, she is taking many with her. (2 Peter 2:2).